It doesn’t matter where you are and what the weight may be, God hears when you call and His answer will be the best for that situation. 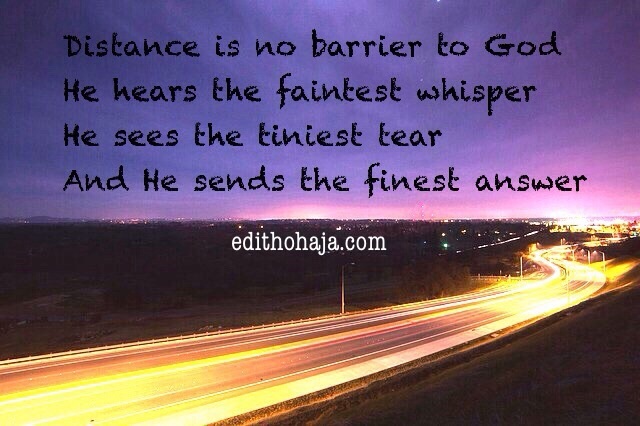 Distance is not a limitation for the love of God towards us. He is always there even in our times of sorrow. I appreciate your love for us, oh! God. God is everywhere. In the air we breathe, even in the darkest places he sees all. He knows all. Down to the number of hairs on our head. Truly, no place is hidden from God. Never shall one be thrown to where God cannot find. The whole earth lies bare before it's Creator. He hears our faintiest groan. He knows all our hearts. Very short and wonderful You have become my secret mentor I just pray to God to give me the kind of writing skills you have.. You are forever blessed..
God said in his word that its only sin that serves as a hindrance from him hearing us. So living a life without sin,Gods ear is ever open to hear our call. Truly,distance is not a barrier for God to answer our prayers because he is everywhere.All we need to do is to believe and have faith in him.